The 16-18 piece Mucho Mambo Latin Big Band is available for exclusive performances at special events, conference dinners, high profile venues, balls, festivals and corporate functions. 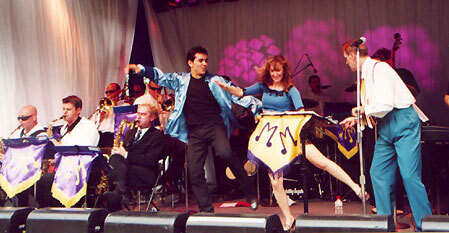 The explosive 18-piece orchestra Mucho Mambo boasts Sydney’s best known Jazz and Latin musicians. Mucho Mambo transports the audience back to the big, bold and brassy Latin sounds of the 40s, 50s and 60s. This unique musical experience showcases the golden era of Latin music featuring the music of giants such as Machito, Perez Prado, Mongo Santamaria, Tito Puente, Tito Rodriguez, as well as modern groups such as Cubanismo and The Afro Cuban Allstars and the more light-hearted mambos of Dean Martin and Perry Como. Full of excitement and fun, the Mucho Mambo orchestra’s stylish performance will have you tapping your toes and grooving to the timeless sounds of Mambo. This music is ideal for any age group and for those who want to really make a memorable night. A musical and visual spectacle not to be missed! Since their brilliant debut at The Basement in Sydney,they have wowed audiences at the Latin Fiesta in Sydney's Darling Harbour and the Global Village Festival on New Years Eve at Hyde Park. Be transported to the funky sounds of Latin New York! We (Talent On Line) went to see Mucho Mambo performing at the Basement in February and the audience were ecstatic. They guest starred Latin / Jazz singer Monica Trabaga who delighted the audience with her colourful banter and fabulous renditions of classics from the Cuban, Italian and other Mambo repertoires. Superb act!